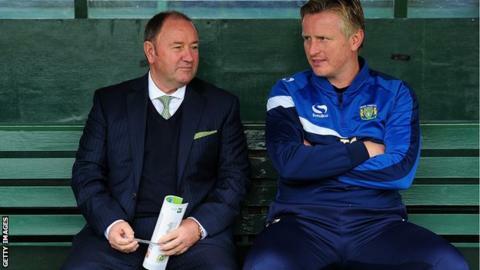 Yeovil boss Gary Johnson has admitted every manager has a "shelf life" but insists he will do all he can to turn around his side's poor form. The 59-year-old has led the club to three promotions over two spells. But Yeovil have only won three times in League One this season and are third bottom in the table. When asked if his history with the club has kept him in the job, Johnson said: "Maybe, but you'd have to ask the boardroom and see how they feel." He continued: "Everyone has a shelf life and if people are deciding that's now, then that's up to them. "From my point of view, we'll do all we can to turn this around." Of the four League One teams who have changed their manager so far this season, Scunthorpe are the only side below Yeovil in the table. Johnson took Yeovil from non-league to League One during his initial four-year spell at the club between 2001 and 2005. He went on to manage Bristol City, Peterborough and Northampton before returning to Huish Park in 2012, replacing now assistant manager Terry Skiverton. Only 18 months later, Johnson took the Glovers to Wembley where they beat Brentford to win promotion to the Championship for the first time in their history. With the smallest budget in the league, Yeovil won eight and drew 13 of their 46 games and finished bottom of the table. This term, they have dropped out of two cup competitions and have taken 13 points from a possible 45 in the third tier. Yeovil were booed off at half-time and full-time of Saturday's 3-0 home defeat by Rochdale and Johnson admits he is in one of the toughest periods of his tenure. "I'm not sure how many more defeats Yeovil can suffer before the board do start to talk about Gary's future. It sounds unthinkable after what he's done for the club in the past but I don't think he's got too many more chances. For me, the next couple of weeks are crucial. They've got Chesterfield away on Saturday and then the FA Cup first round. A first-round exit would be disastrous." "It's up there with the hardest," he said. "We've had a lot of good days here at Huish Park and on the bad days, people have every right to express their opinion of how the game went. "My resolve is strong because this is a group I've brought in. There's no excuses that' I've taken on somebody else's group. "As a coaching team we've got to get them as fit as we can, mentally and physically, and then hope we can get a win pretty soon."